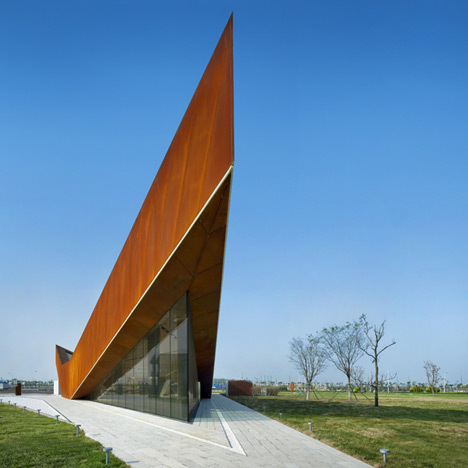 Here are some images of an extremely pointy pavilion in Tianjin, China, by Singapore studio Ministry of Design. A band of Corten steel cladding surrounds the triangular building, pitching upwards at each corner to cantilever over triangular windows. Doors on two of these glazed corners provide separate entrances to a showroom and an information centre, both for property developer Vanke. A lounge and bar for entertaining clients is located in the building’s third corner. We've noticed a trend of Corten-clad buildings lately - see a few more of them here. Photography is by Edward Hendricks, CI&A Photography. Designed as a permanent show gallery and tourist information center for China’s largest developer Vanke, MOD’s dramatic design for the TRIPLE V GALLERY has become an icon along the Dong Jiang Bay coastline. Despite its obvious sculptural qualities, the building’s DNA evolved rationally from a careful analysis of key contextual & programmatic perimeters – resulting in the TRIPLE V GALLERY’S triangulated floor plan as well as the 3 soaring edges that have come to define its form. The client’s program called for 3 main spaces: a tourist information center, a show gallery & a lounge for discussion. Requiring their own entrances, the tourist center and the show gallery are orientated to separate existing pedestrian pathways and can be operated independently. An extension of the show gallery, the lounge area is where discussions are conducted. This space takes advantage of the panoramic views of the coastline and comprises a sculptural bar counter. Contractor: Nantong No.2 Construction Group (Archi), Beijing Grain. Rain Architectural Design Co., Ltd. (ID) C&S: Tenio Design And Engineering Co., Ltd.
M&E: Tenio Design And Engineering Co., Ltd.